Are you interested in walking to the Beachy Head Lighthouse? If so, read this first. The Beachy Head Lighthouse is an operational station and is owned, maintained and operated by Trinity House. Due to this, you can’t visit the Beachy Head Lighthouse, you will not be allowed in the lighthouse and technically stepping foot on the lighthouse is trespassing. The Beachy Head Lighthouse is situated at the base of the cliffs at Beachy Head and can only be reached at low tide. It is very, very important that you check the tide tables before setting off otherwise you could get cut off, stranded and possibly drown. It is also important that you wear sturdy footwear, i.e. walking boots as the terrain can be hard going in places requiring you to clamber over rocks. Careful planning can prevent injury and save you from a calamity. The Beachy Head Lighthouse can be reached at a low tide and the best time is about one hour before or after low tide. You getting different heights of low tide. At a very low tide it could be down to about 0.2 metres and but a high-low tide could be 2 metres or more. This can make a dramatic difference to how low the water level will be, how much of the beach you can access and the time you have available to do the walk. The Beachy Head Lighthouse stands at the base of Beachy Head cliffs which are 172 metres or 531ft high. 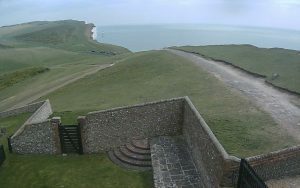 The only two points of access are Birling Gap in the West or Cow Gap in the East. You can park at the car park at the National Trust visitor centre at Birling Gap. You can descend the stairs to the shingle beach to begin your walk. The distance to the lighthouse is 1.93 miles or 3.11 km. Cow Gap has stair access to the beach, but first you need to reach cow Gap. You can park at the Beachy Head Hotel and walk down to Cow Gap (.8 km or .5 miles), or you can park at top end of Dukes Drive (B2103) in Eastbourne and walk along to Cow Gap (1,94 km or 1.21 miles). The distance to the lighthouse is 1.01 miles or 1.63km. I take no responsibility for your walk and this information is provided as I get asked this question a lot. I think it is a great opportunity to visit the Beachy Head Lighthouse and get a sense of scale at it’s size when you’re standing up close as it looks so small from a distance. Also spend a moment to think what it must have been like to be stationed on the lighthouse for three months at a time with only the company of your two fellow lighthouse keepers and nowhere to go and with very little room in the lighthouse to move around in. I am well prepared because I am aware that anything could happen at any moment, I could trip, fall, sprain or break my ankle, I could get trapped by the tide or I could encounter other people in difficulty. Keep as far away from the cliffs as possible as a fall could happen at any moment. I was walking about 10 metres away from the cliffs a few years ago and I heard a heavy thud just to my side. I looked down to see a jagged sharp lump of chalk about 8 inches across. I still have that lump of chalk as if I had been a metre closer it would have killed me. Be very careful of your footing as it is very easy to slip off a rock, twist or even break your ankle. Take it slow, don’t rush and don’t definitely don’t run. If things do go wrong and you are cut off by the tide, the main thing is don’t panic. The worst thing that can happen is that you’ll be stuck for six hours waiting for the tide to turn and go back out again. Do not try to climb the cliffs. They are very unsteady and could fracture at any time and tend to be covered with loose bits of chalk and boulders. Study the cliffs carefully and look for the high water mark. The tide can be over 8 metres at its highest and due to this you need to be above the highest point. This can be seen by a green line or seaweed mark on the cliffs or boulders. Clamber above this point and wait it out. This is why it pays to be prepared as if you have enough clothing, you’ll be warm and if you have food and water, you won’t go go hungry or thirsty. When the tide retreats, you can retreat. In case of an emergency, dial 999 and ask for the coastguard. Don’t let this put you off. On a nice day, it’s a wonderful walk, just be careful. With thanks to Eastbourne Borough Council you can download the tide tables booklet or visit their website for more information and to buy a tide booklet. I perform talks about the Lighthouses of Beachy Head and would welcome the opportunity to talk to your group about the fascinating history, construction and life of Beachy Head's amazing lighthouses. How old is the Beachy Head Lighthouse? The lighthouse is 116 years old. You can read more about the history of the lighthouse. Looking for pictures of the Beachy Head or Belle Tout Lighthouses? I have an extensive range of photos available on Flickr. My photography has been used in books, magazines, by film production companies and on TV around the world. Please contact me first if you would like permission to use any of my pictures and which photos you would like to use and for what purposes.